Spring Break presents an interesting conundrum for one trying to time travels around school holidays: what if the weeks off overlap? Such was the case with my niece Lola and Mathew’s friend Jasmin, who’s teaching school in Cairo (we also met her last April in Malta). 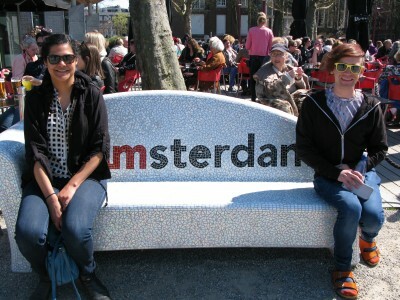 This year, both Jasmin’s and Lola’s school vacas were on adjacent weeks — and I was determined to both conclude my Lola travels and meet up with my beau and his pal at their destination of choice this year: Amsterdam. 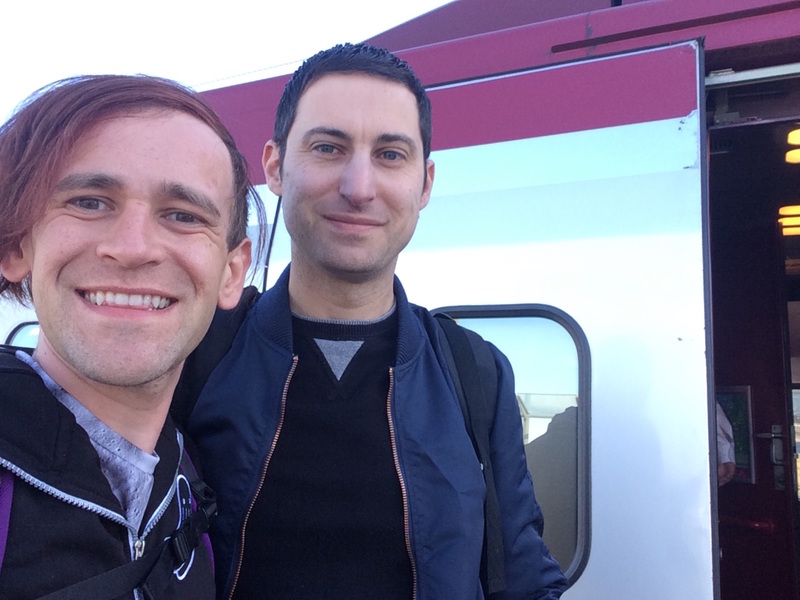 But… that wasn’t it: Mathew and I had also pledged to take a grand rail journey across Europe to our longer-stay destination in the Algarve, in southern Portugal. I’d scoured rail websites for months before this, and plans were set in motion. Suffice it to say it was going to be an interesting week. It all began last Tuesday: two Paris Metro rides, one Eurostar trip back to London, a Tube to the Heathrow Express, then a flight to Montreal on a jam-packed plane to return Lola safely to her family. All in all, her trip seemed as much a hit for her as it was for cousin Jackson a year ago; next day in school, a gaggle of classmates surrounded her and pumped her for details of her voyage. For me, the joy of actually seeing a kid’s horizons broaden before my very eyes proved priceless indeed; guess there was something to those MasterCard ads from a few years back. Now I know how flight attendants feel, I mused, as I savored a layover of some 24 hours in my hometown, Montreal. To say my circadian clock was a mess would be an understatement as I ignored jetlag as I labored to stay on Europe time. The pleasant sunny weather in Montreal — finally warming up after a long winter — felt more surreal and bright than welcomed. 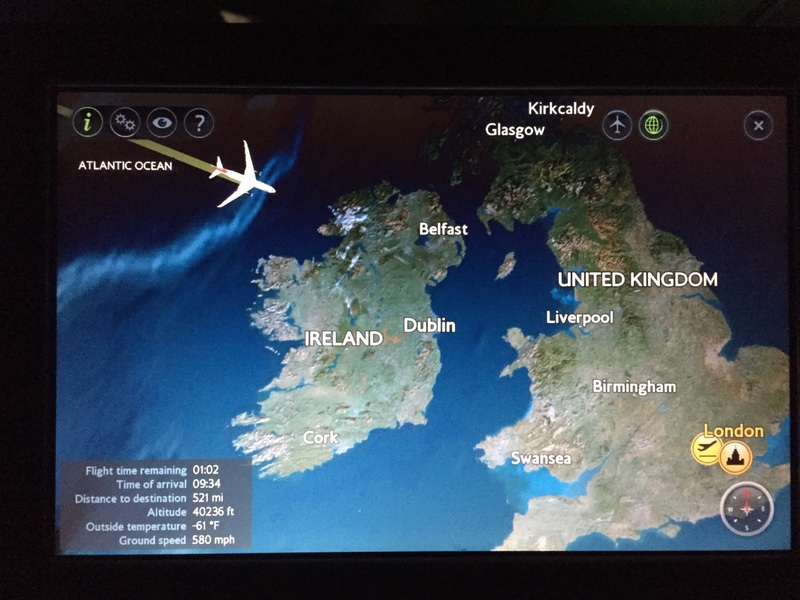 As evening approached, I returned to the airport and re-boarded that same British Airways flight for a hop back across the pond. Arriving at Amsterdam’s Schipol airport aroused a well of memories: while I lived in the Middle East as a boy my family flew KLM a lot, connecting through this major Western European gateway. My earliest memory of running to catch a connecting flight was here. 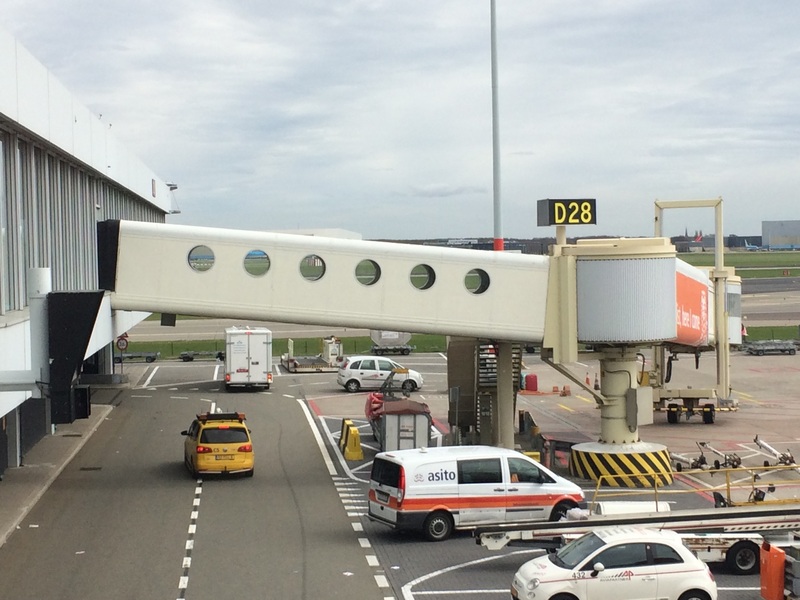 Those large, modern walls of glass and round jetway windows brought it all back to me. Amsterdam, meanwhile, retains that distinct mix of prim, flat-fronted canal buildings and carefree laissez-faire fun I remember from seven years back in my big world journey. I slept like a log the following two nights, the faint racket from bars downstairs from our accommodations — an attic apartment in a canal townhome — hardly fazing me. After getting back into the swing of remote work, I joined Mathew and Jasmin for a spin through the Red Light District. It remains an odd juxtaposition, historic churches and scantily-clad prostitutes and gawking tourists on narrow streets. But heck, it’s fun. 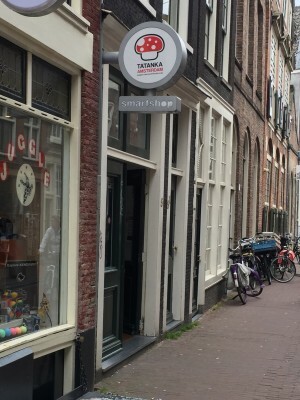 In spite of a Dutch shift toward conservatism a few years back and the banning of Magic Mushrooms not long after my visit in 2008, little has changed in the “soft drug” scene in Amsterdam from my memories. 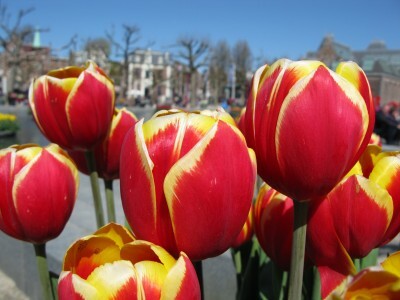 Efforts to restrict cannabis sales to locals fell flat, particularly in Amsterdam. And the Mushrooms ban extended only to a number of strains of the plant – a variant, magic truffles, remains legal. While there are said to be fewer Smartshops selling psilocybin products as there used to be in years past, we had no trouble spotting quite a number. The coffeeshops, meanwhile, remain evergreen (pun intended) in the city, offering all manner of cannabis products for sale. 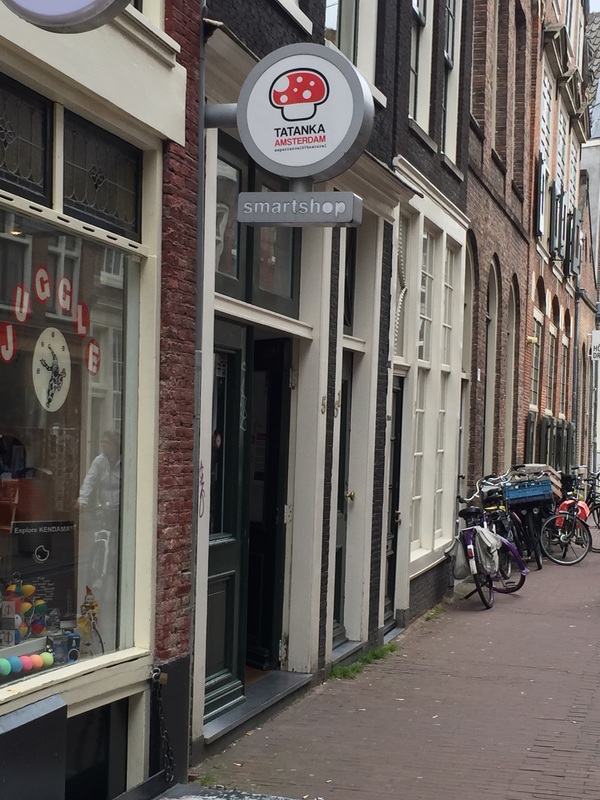 Actually, judging how far things in the States have come, with five states legalizing the stuff and numerous others (including California) offering it medicinally with little fuss or muss, the Netherlands’ experiment feels at once trend-setting and prosaic. Although the Rijksmuseum has finally reopened after years of remodeling, Mathew and Jasmin were looking for a less daunting art appreciation experience on their last day in the city. So we went next door (wisely buying our tickets at the line-free kiosk a block away) to the Van Gogh Museum, where I got to once more appreciate the once-unappreciated tormented genius of this master painter. We made our way back to the train station, bade Jasmin farewell, and looked for the NS International Lounge whose access came with our train tickets. Alas, we picked the wrong week: it was closed for remodeling, though the Starbucks next door offered similar high-vaulted ceilings and grand Victorian architecture. We boarded our high-speed Thalys train (successor to the old Trans Europ Express) and rolled out of Amsterdam in the late afternoon light. Why do this overland? Well, a long time ago on a continent rather far away, my budget-minded and sun-starved Canadian family went on the mother of all road trips: we packed up our station wagon and drove from our home in Montreal all the way to my grandmother’s apartment in North Miami Beach. Although the allure of surface travel persists from those halcyon days, my one complaint with road trips is the need to drive oneself. 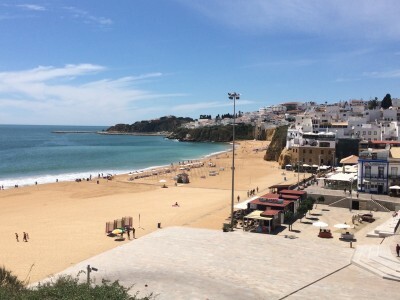 Europe offers a tantalizing way out of that conundrum: although the Continent is a lot smaller than North America, traveling from end to end is actually comparable in distance to that long-ago journey from Montreal to Miami – in our case, on this trip, from Amsterdam to Albufeira, Portugal. Thanks to high-speed rail, a journey like this can be accomplished in half the time as conventional driving – and all without the need to get behind the wheel. 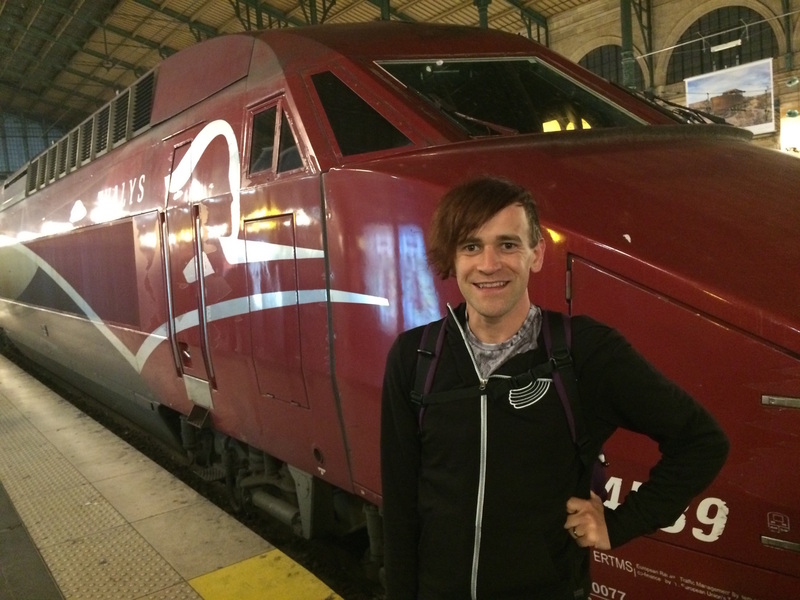 We rocketed through the Netherlands and Belgium — last time I took this train these portions of the line hadn’t yet been upgraded to true high-speed — arriving some three hours later at Paris Gare du Nord. It was my third time transiting through this station in just over a week. Since it was late, we skipped urban rail and hopped in a cab to our cute little hotel right near Gare de Lyon. It was a mild Parisian evening, and the city bustled as we called it an early one in preparation for our big next day. 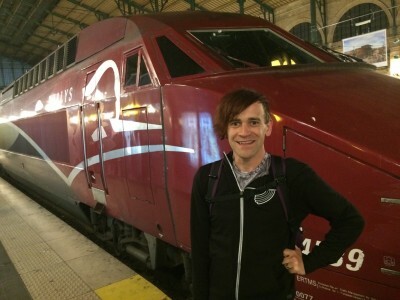 Next morning, a five minute walk toward the great clock of Gare de Lyon, then a climb onto the double-decker TGV Duplex for a lengthy yet speedy train ride across France. 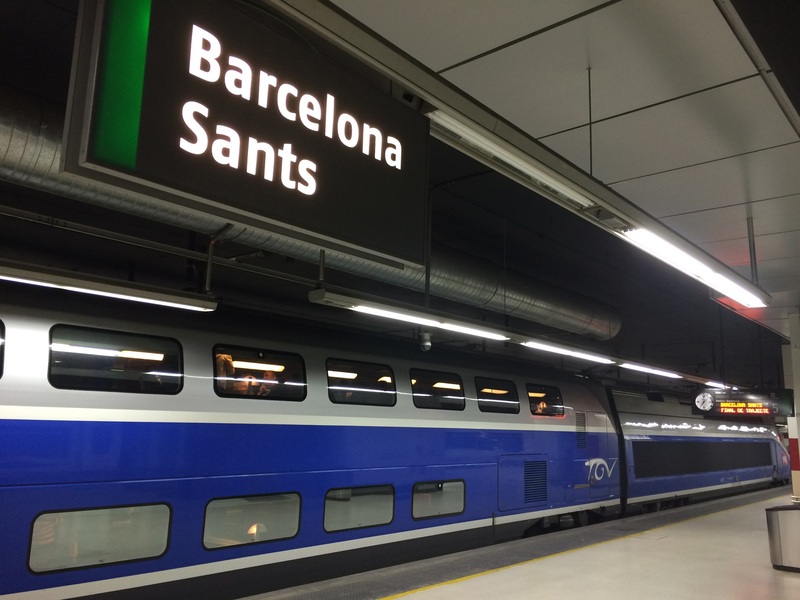 We left the plains of central France behind and slid through tunnels under the mountains of northern Spain to arrive at Barcelona Sants station in the early afternoon. 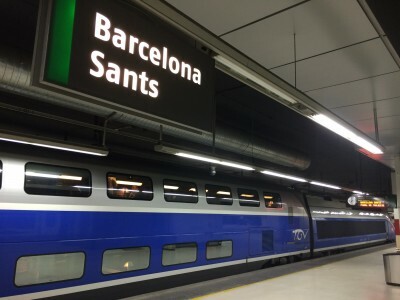 A bite of lunch, then back on another train – this one a Spanish high-speed AVE – to cross most of the Iberian peninsula toward our next stopover for the night. I have yet to visit Spain, but the views out the window of the Spanish countryside have only further whetted my appetite: verdant fields and glorious mountain vistas glowing in the late-afternoon sun. Mathew, meanwhile, found the experience a bit more jarring: at Zaragoza a rather loud group of schoolkids filled up our mostly empty carriage; at our destination point for the night, Seville, our taxi driver sat lazily in his cab while we hauled out our baggage; at check-in at our hotel, front-desk staff chatted with their cohorts for a spell before getting us situated. All that efficiency we’d become accustomed to in Europe’s more northerly big cities was less apparent here. Nonetheless, things moved expediently: our hotel in Seville lay just across the street from our next transport terminal. 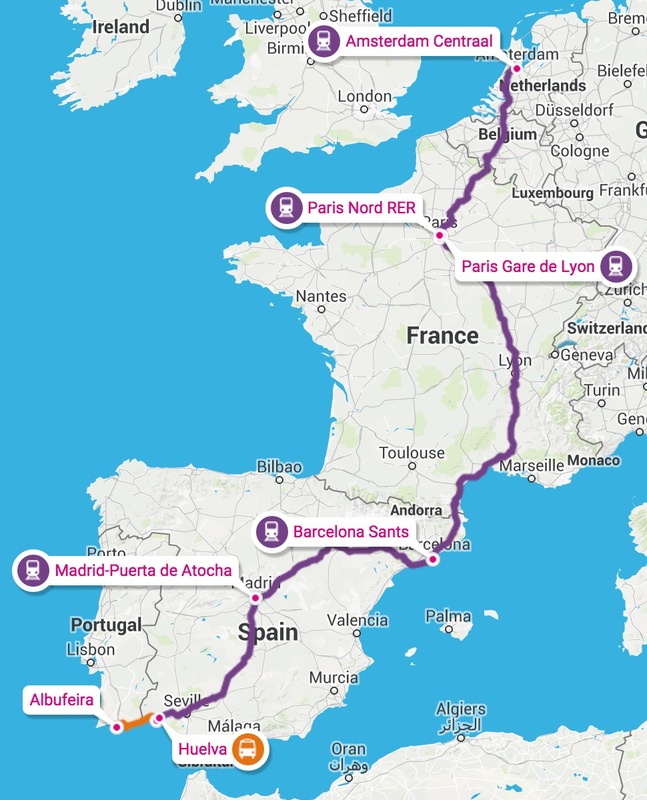 Although we’d aimed at doing trains the whole way, realities made that challenging: Europe’s Iberian neighbors both have pretty sophisticated rail networks, but interconnections are still in progress: to date there’s no high-speed link between the two capitals, Lisbon and Madrid; nor are there any links between high-speed lines in Andalusia in southern Spain, and Algarve rail in southern Portugal. 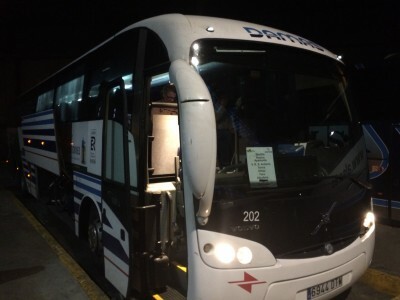 So we opted to make up the distance in a more prosaic fashion: a bus making the run out of Seville. As with the previous morning in Paris, we rose at the crack of dawn and boarded the conveyance. Morning light filtered into Seville’s historic center as we crossed the river and headed west toward our final destination. I always have this fear, when taking buses in foreign countries, of what I call “chicken bus” syndrome: it’s based on that scene in Romancing the Stone, where Kathleen Turner gets on the wrong bus from the airport in Colombia and ends up on a rattletrap with luggage on the roof and peasants within, chickens in arm. Interestingly, none of my bus experiences in South America came close to this cliché. Here in Spain, however, our DAMAS bus (their version of Greyhound) was a bit less fab: so-so on cleanliness, and milk-run-level stop and go – including one unusual pull-over as we crossed into Portugal, where uniformed inspectors examined everyone’s passports. “Ah. Now we will be delayed,” fumed an older gentleman seated in front of us as Portuguese officials grilled a couple of passengers. The EU has mostly made these border checks obsolete, but a few nations still keep them alive. The fellow chatting with us was a tour operator who hailed from Madrid, catching a train out of Faro. Happily, we were released soon after, and made up time as we rolled through the orchards and green hillscapes of the Algarve. A couple more stops, and we were at our destination for the next three weeks. We had traveled some 1,800 miles (about 1,300 as the passenger jet flies) from near Europe’s top to its bottom in about thirty hours (including two overnights)… all without leaving the ground. Mark Vogler liked this on Facebook. Mathew Guiver liked this on Facebook. Tomasz Pado liked this on Facebook. Miri Jedeikin liked this on Facebook.